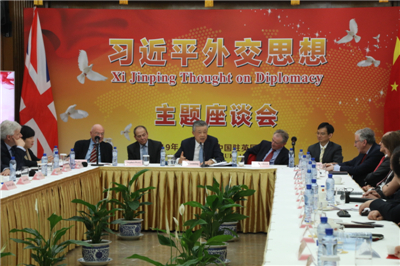 The Chinese Embassy Holds Symposium on "Xi Jinping Thought on Diplomacy"
On April 9, 2019, the Chinese Embassy in the UK held a Symposium on “Xi Jinping Thought on Diplomacy”. Ambassador Liu Xiaoming delivered a keynote speech entitled Learn the Oriental Wisdom and Understand the Future of China. 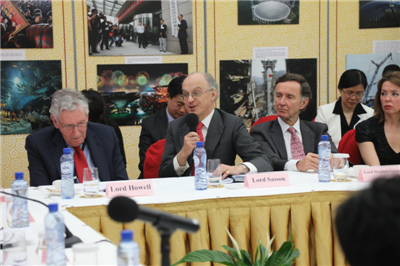 Stephen Perry, Chairman of the 48 Group Club, Professor Martin Albrow, Honorary Vice-President of the British Sociological Association, Martin Jacques, a renowned scholar, and Fang Wenjian, Chairman of CCCUK made speeches respectively. Over 70 people were present, including the Rt Hon. Lord Howell of Guildford PC, Chair of the House of Lords International Relations Committee, the Rt Hon. Lord Sassoon FCA, Chairman of CBBC, the Lord Green of Hurstpierpoint, Chairman of Asia House, Matthew Rous, Chief Executive of China-Britain Business Council, David Sayer, Vice Chairman in Financial Service at KPMG, Dr Nathan W. Hill AB AM, UK Director of London Confucius Institute at SOAS University of London, Antoine Levesques, Research Fellow at the International Institute for Strategic Studies, Ian MacGregor, Editor Emeritus of Telegraph Media Group and representatives from British government, parliament, business, universities, think tanks and media, Chinese institutions and overseas Chinese. 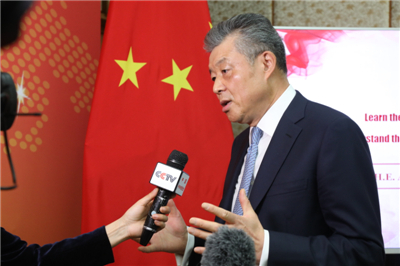 Ambassador Liu Xiaoming pointed out that the successful state visit by President Xi Jinping to the UK in 2015 not only ushered in the China-UK “Golden Era”, but also charted the course for China-UK relations in the second decade of the 21st century. Xi Jinping Thought on Diplomacy has given the best answers to the questions of whether China’s development is an opportunity or challenge, how a richer and stronger China will behave, and how it will influence the world. 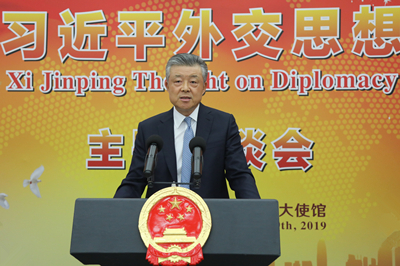 Regarding the core of Xi Jinping Thought on Diplomacy, Ambassador Liu noted that it is the guiding thought that provides basic principles and guidelines for China’s foreign policy. It is an innovation, a breakthrough and a leap forward in the evolution of the thought on China’s diplomacy. It inherits and develops China's cultural and diplomatic tradition, encapsulates the concepts and practice of China's diplomacy, and provides an assessment and definition on the development of the world and the role of China. As the world is undergoing profound changes unseen in a hundred years, China’s diplomacy should play its role in striving for national revitalization, promoting the progress of mankind, adopting a correct historical perspective, and seeing the big picture. China will continue to be a builder of world peace, a contributor to global development and a defender of international order. Regarding what Xi Jinping Thought on Diplomacy means to the world, the Ambassador pointed out that it gives a global significance to the Chinese Dream, emphasizes ever close ties between China and the world and advocates the ideal of “one world, one family”. It draws a new blueprint for human progress, explores a new thinking on international relations and provides a new guideline for global governance. After the speech, Ambassador Liu had an in-depth exchanges and discussion with the participants. Sharing his own experiences and thinking, he answered questions on the tradition and innovation of China’s diplomacy, China and international order in the new era, the contemporary western political thought and relationship between major countries, how Eastern and Western cultures seek common ground while reserve differences, and the significanse of the BRI on China-UK relations in the context of Brexit. 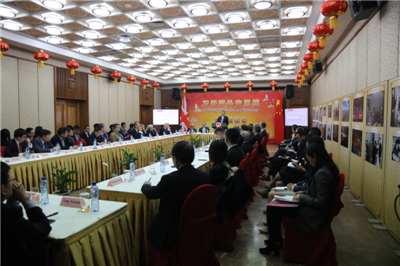 The participants welcomed the opportunity to learn about Xi Jinping Thought on Diplomacy and its far-reaching impact through Ambassador Liu’s speech. 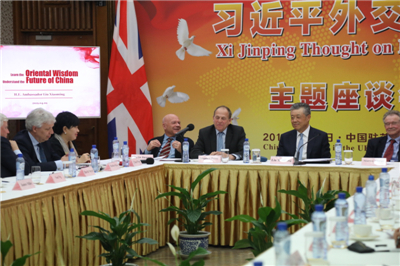 The symposium is timely helping various sectors in the UK to learn and interpret Xi Jinping Thought on Diplomacy and China’s diplomacy in the new era correctly. They also shared their understanding and interpretation of Xi Jinping Thought on Diplomacy, of China’s traditional philosophy, such as “One World, One Family”, and of China’s “world vision”, the Belt and Road Initiative and the concept of building a community with a shared future for mankind. After the symposium, Ambassador Liu gave interviews to journalists from China Media Group and Xinhua News Agency respectively.